DJI Spark vs. Parrot Bebop 2 – What’s The Difference? DJI announced earlier this year that they will launch a new drone that will make any drone lover want to buy it. However, let’s see first how this drone compares with the Parrot Bebop 2. The DJI Spark weighs significantly less (300g) than the Parrot Bebop 2 (500g). In some ways, that extra weight is good because it gives a more stable flight and the wind won’t affect the drone as much as it does when it comes to lighter ones. The Parrot Bebop 2 has a bigger battery than the DJI Spark which gives the user a longer flight time. For the Parrot Bebop 2 the flight time lasts up to 25 minutes whereas the DJI Spark has a flight time of 16 minutes. The DJI Spark has a maximum speed of 50km/h, which is less than the Parrot Bebop 2 with 10km/h. Parrot Bebop 2 has a 14 MP camera making it able to record full HD videos and take amazing photos, while the DJI Spark has a 12 MP camera, but the video recorded with this drone are as clear as those recorded with the Parrot Bebop 2. The resolution of both having 1920 x 1080 at 30 FPS. The Parrot Bebop 2 doesn’t have the obstacle avoidance feature, whereas the DJI Spark does have it. In the end, these are two different drones, with small differences between them. Both of them are good drones, but this comes more up to what you would like to do with the drone. 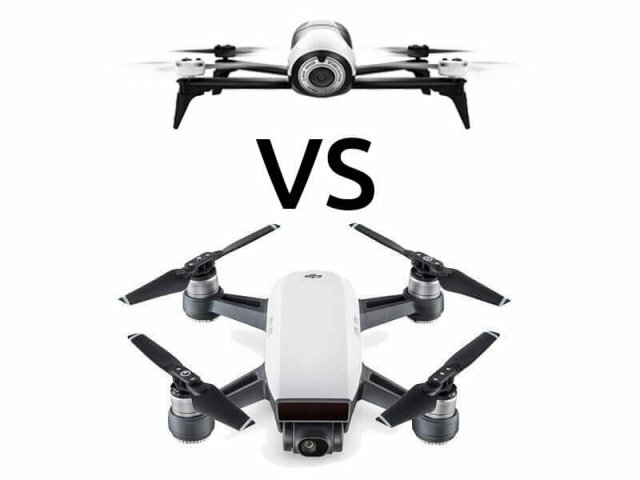 Every drone is different, the Parrot Bebop 2 has a bit more better features, but the price is higher compared to the DJI Spark which is easier to transport and is almost as powerful as the Parrot Bebop 2, also it’s a bit cheaper. Check both out and choose your favorite.